There are a number of places on the east coast of Mauritius, not far from Azuri, where you and your family may visit for a well-spent outing in the nature; we have tested some of them to provide feedback for you. On April 18th, we visited 3 sites all within fewer than 15 minutes away either by car or on foot. Find out below, what you can expect to find, when going to Bras d’Eau National Park, La Cave Madame and The Mangrove Trail. Bras d’Eau National Park is located less than 15 minutes south of Azuri along the main road towards Flacq. Bras d’Eau is the second national park to have been designated in Mauritius – on 25 October 2011 – and covers an area of 497 hectares. The name originates from the shape of its water mass, which resembles an arm protruding from the land. The park is home to 6 rare native flora and 2 endemic bird species, among which are the Grey White Eye (Pic Pic), the orchid Oenillia polystachys and two types of ebony. Information about these and other Mauritian plants and animals is on display at the Visitor Centre, situated next to the parking area on the right side of the road as you approach the park (located a few hundred metres along the winding part of the road after passing the windmills). 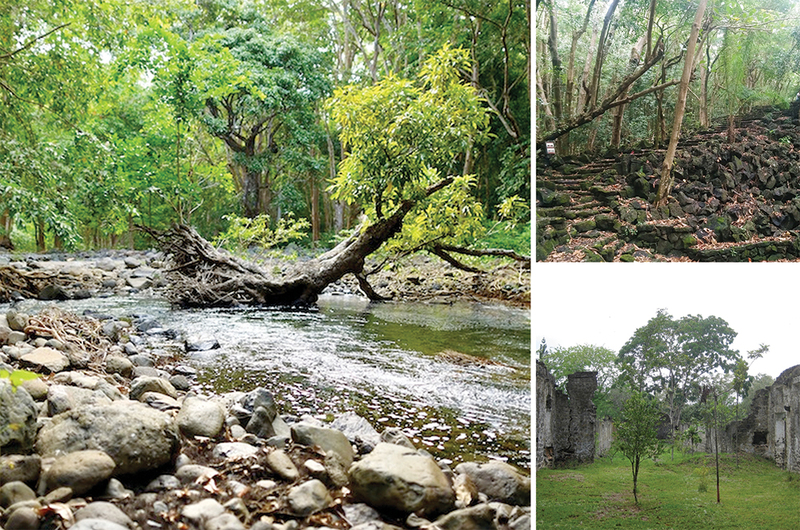 We set off to walk along the Coq de Bois Trail, though not before having visited 3 giant Aldabra tortoises and admiring the stone ruins of the Old Sugar Mill, the Puits Français (French Wells), and other adjacent 19th century buildings, setting an epochal mood for our upcoming hike. The trail leads to two water body destinations between 1.8 to 2 kilometres distance along a sometime beaten, often rocky path which winds right and left, up and down. Be sure to wear sturdy, skid proof shoes to assure protection from slippery stones and muddy paths (it had rained prior to our visit), as well as some steep, stony and sometimes loose inclines. The sights and sounds and scents of the forest are truly wondrous – several metres into the thick, one loses awareness of the nearby road and falls under the trance of the woods: tall majestic trees reaching up to the open sky; gnarled roots grasping the earth; variant ferns and mosses juxtaposed with lichens, succulents and fallen leaves; volcanic rock strewn amongst it all or creatively piled along the pathway; twittering birds, the breeze and the enveloping calls of nature; perfumes of pine, eucalyptus and the ocean rising from the ground, emanating from trees, reaching from the sea. At about 700 metres, there is a divergence on the trail whereby one may continue directly towards the two marshes or leave the track to follow a 2.3 kilometre loop deeper into the forest – the loop eventually re-joins the main path around 700 metres from its end. This detour promises more certain viewing of the endemic birds of the forest. The loop footpath appears to be dirt only and may be narrow in certain areas – we did not test it. The Coq de Bois Trail will likely take a seasoned hiker 1 – 1.5 hours down and back (including Visitor Centre); with the Loop, one may expect another hour or so, allowing for browsing and observing. Or you may do what we did and turn back at the first bypass which kept our excursion to around 45 minutes. There are a number of picnic tables if you fancy bringing drinks or a light meal – please collect and dispose of all rubbish in bins provided by the park service. 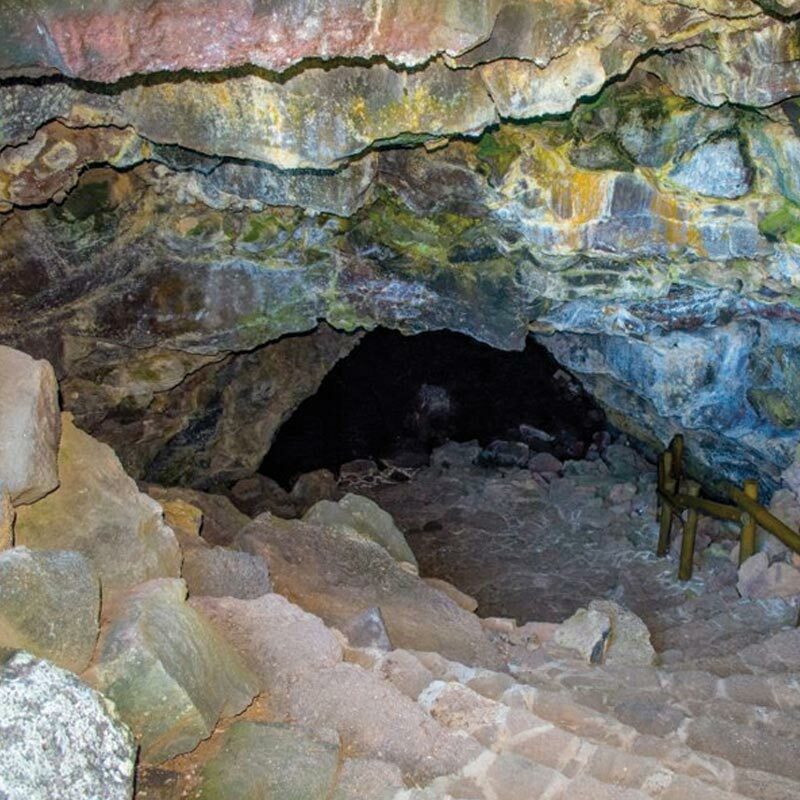 La Cave Madame – also known as Roches Noires Caves – is a natural volcanic cave bubble found along the main road at the centre of the village of Roches Noires, 5 minutes south of Azuri. Signs are posted several metres before the left-hand turn – look carefully for a panel on the wall which borders the site; you may park under the trees. A small park surrounds the stone stairway which descends as a semi-circle into the cave. A trickling pool of cool water awaits at approximately 2 metres from the stairway’s bottom; paved rocks spread before you. 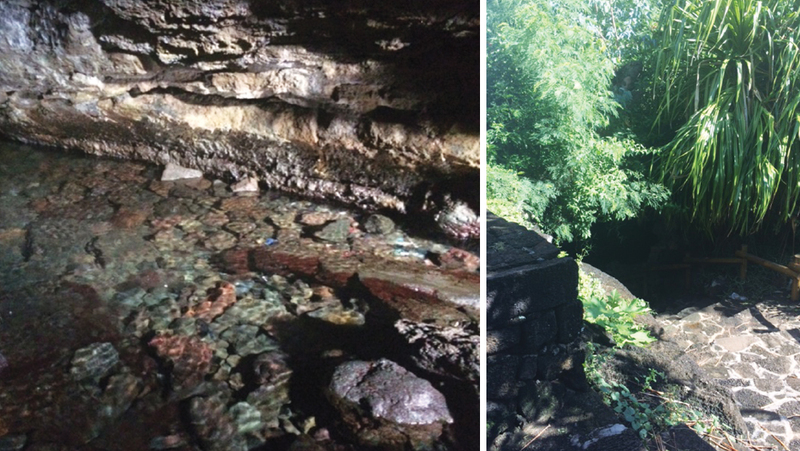 The ceiling of the cave dips ahead impressing how close it is to the water level. We tried seeing into the distance but our cell phone torches were not powerful enough. Beautifully still, the sun shining from behind, a few minutes’ repose in the soothing depths was enough to calm our spirits. A perfect place to visit when passing to or from another destination along the east coast road. The Mangrove Nature Track at Radisson Blu Resort is right in your ‘front’ yard. Children who spend the day at the resort’s kids club are taken here on outings with a knowledgeable guide who will lead them down the sandy path and explain about the bio-diverse life which exists in lagoon-side estuaries such as this mangrove forest. Sludge through tangled mangrove roots to learn about the different manglié species of plants and explore the remarkable habitat of its crabs, birds and other marine creatures. Parents may also come with children for a self-guided tour by following the accessible and well-described boards and signs. The length of time spent will depend upon how much exploring you wish to do.